I’ve just spent half a day in bed with a don’t-move headache. A no-lights, stomach-churning, over-the-eyes migraine. And I haven’t had such a heart-warming time in months. With my youngest at age four, resting should be simple, nothing like past experiences of nursing a baby while throwing up. Through the dark and quiet walls come the rattle of cereal bowls and the clink of ice cubes. Grateful for my capable twelve-year-old, Angela, I find a position that creates the least pressure on my head. Screeech! Bang! The bedroom door lurches open, then shut. I wince. Screeech! Bang! Nine-year-old Lindsay arrives with a plate of delicacies: a brownie, four frozen blueberries, three frozen raspberries, and a tic tac. Ten quiet minutes elapse. My stomach is riding a stormy sea. Screeech! Bang! We really need to oil the door. Bare feet bound in, and two pairs of shining eyes beam over my bed. My little boys. “Mommy, I made a card for you!” Four-year-old Rodney bounces up. “Here, open it, Angela helped me make it.” He jumps up and down, up and down. The ancient card, picked from a garage-sale bundle, proclaims “With Sympathy”. With one eye open, I read the inside death-in-the-family sentiments framed with alphabet stickers. Suddenly Rodney yanks back the card. “This green sticker isn’t straight!” he cries. He peels it, and the card tears. “Now I need to make you another one,” he pouts, crumpling it. But I am experiencing an over-abundancy of noise and movement and little bodies. I try nicely thanking them for their cards while firmly stressing that no one should come into the room for one hour. They cheerfully troop out. Christmas Eve, 10:20 p.m. One last check on the boys as they drifted off to sleep. Then I heard it. A groaning cry. “My tummy hurts!” Quickly guiding Richard into the bathroom, I ran for a bucket. In disbelief, I heard Rodney crying out. Just in time, I stuck the bucket under him. Within a minute, they’d both vomited. 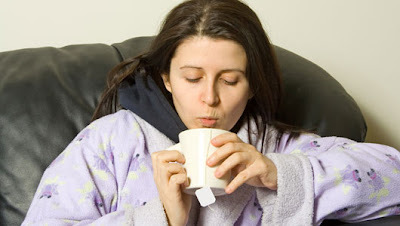 The stomach flu, no doubt. What a night: two boys and two buckets. Every 15-20 minutes I leaped up and grabbed one or both buckets. A well-synchronized pair, they always vomited within a minute or two of each other. Once I had a bucket held out in each hand. Poor little boys with faces white and tummies twisted. I lovingly patted their backs. I wiped faces, and offered sips of Sprite. My own stomach never once churned. With a book and a Bible beside me, I read, slept, jumped up, prayed, snoozed, jumped up, and repeated. My husband and two oldest children, squeamish and wide-awake, retreated to the farthest end of the house where they tried drowning out the acoustics. Occasionally my husband emerged to peak in. “I wish I could help,” he’d say, “But my own stomach is hurting.” His face would twist into a something-smells-awful look and he’d breathe, “You’re beautiful. You are so beautiful!” before quickly retreating. Activity finally ceased at 2:00 a.m. In the kitchen, dishes rattled and banged. The door remained closed. I felt myself drifting away. My eye was not only mourning by reason of affliction, it was weeping from laughter, and the love-warmth of children. Eventually I slept, eventually the pills worked, and I awoke with pain abated and a warm realization. The realization was that in the “normal” sicknesses of family life we’ve formed some one-of-a-kind memories that cannot be created any other way. Difficult memories, tiring ones. But memories of support and care. Memories of being there for each other when we most need a loving touch. So I stand with a bucket outstretched in each hand and I say that almost I enjoy ill health. 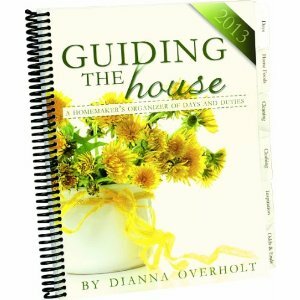 ~ Guest post by Dianna Overholt who is a Mennonite mother of five and author of Guiding the House, which is a delightful Home Organizer. See our last giveaway for details. And here is the EXCITING announcement! If you missed out on the giveaway, you can now get your very own copy HERE for only $9.95! Don't miss it! "I absolutely love this planner. It is keeping me more organized and love the different sections included in the planner..not just calendars but places to keep food inventory, bible verses to memorize, projects, and more. I will definitely purchase again. I'd recommend it to any SAHM / SAHW / or anyone wanting to keep track of sections it offers other than just the calendar portion." "I am new to planning my days, but am already helped by using this. Everything I need to remember is kept in one place. The layout is great and the quotes are inspiring and helpful. Thank you Dianna for designing a wonderful planner!" Also you can find more details at Dianna's site Guiding the House!